As with most gear lists, this is a dynamic, in-process inventory of what I plan to use on my Pacific Crest Trail thru-hike in 2016. After months of procrastination, I am now pretty settled on this lot and happy with the weight … I think. I do of course reserve the right to procrastinate a bit more and change my mind … yet again! For a quick glance at my gear list on LighterPack, please follow this link: Zenlightened Voyager 2016 PCT Gear List. For a more detailed look at how I intend to use each piece of kit and a brief explanation as to why I have chosen each item, please read on. In the fullness of time, I hope to provide an in-depth report on how well everything performed out on the trail … stay tuned for more. During the process of building my own gear list, I scrutinised a multitude of other people’s inventories. This virtual “rummaging” proved to be enormously helpful, particularly with regard to target weights and ensuring that I had all the major bases covered. Initially, I had a really hard time accepting how “little” I would be carrying, however, as I started to see the grams grow into kilograms, I soon began to lament how “much” I would be carrying. Weight is everything on a thru-hike. A heavy pack will significantly reduce a hiker’s pace, make them susceptible to injury and cause a lot of unnecessary pain. The temptation, therefore, is to take as little as possible but this strategy can jeopardise personal safety and leave hikers insufficiently prepared for the countless challenges that lie ahead. Packing for the Pacific Crest Trail is a delicate balancing act and its hard to know if you’ve got it right until you’re out there doing it. My base weight is certainly not the lightest, but it’s definitely not the heaviest either. I have a few luxuries that an ultralight purists might consider unnecessary but overall I hope to have reached a viable state of equilibrium … Only time will tell I guess. The ZPacks Arc Blast is an ultralight Hybrid Cuben Fiber pack with a Flexed Arc Carbon Fiber frame. The super fancy material is tough and waterproof. The ingenious frame effectively transfers weight to the hips and up off of the shoulders, while also providing good air flow against the back. With a relatively limited load carrying capacity of 16kg (35lbs), this pack is aimed squarely at the aspiring ultralight thru-hiker. After much hemming and hawing, I finally opted for the 60L pack. The 45L was definitely too small and the 52L might have been a squeeze with a big food carry. Dimensionally the 60L still meets my important criteria of being airline carry-on compatible and the extra 8L of space only adds 6g (0.2oz) over the weight of the 52L. As for the colour, well I ended up going with grey because black was too dull, the indigo too purple, the orange too bright and the green and camo too military. I also added the optional Belt Pouches – 42g (1.5oz) giving an extra 2L of capacity and a small detachable Key Pouch – 9g (0.3oz). The Key Pouch will effectively become my wallet and the Belt Pouches are super handy for keeping things organised and accessible, which means less donning and doffing and more time moving forward. The ZPacks Solplex is an ultralight solo shelter and quite possibly the perfect set up for a thru-hiker. This simple single wall construction is supported by my two Leki CarbonLite Trekking Poles – 404g (14.3oz) and 8 guy points. It offers all-around storm and bug protection with a tiny weight penalty and minimal pack size. 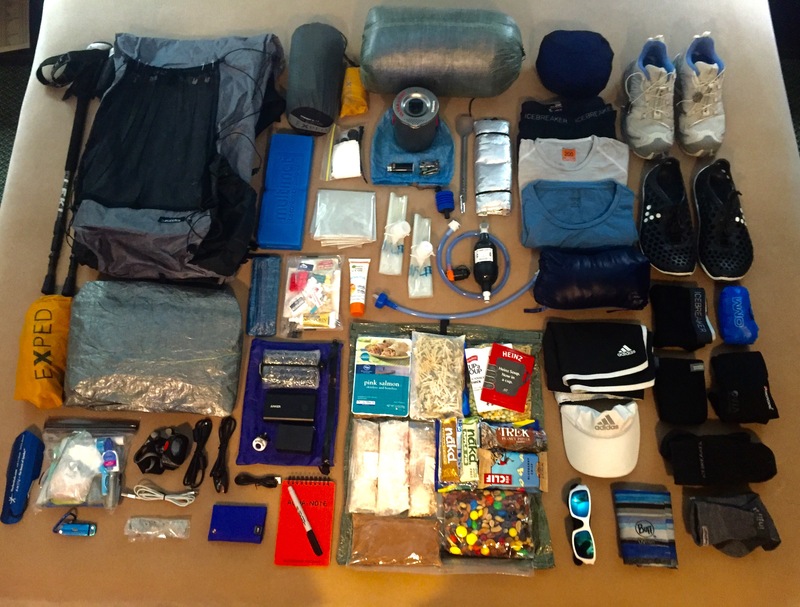 ZPacks Solplex … The perfect set up for an aspiring ultralight thru-hiker! The tent is surprisingly spacious and easily accommodates one small hiker (such as myself) plus gear. The interior floor space is 230cm (90″) x 76cm (30″), with a peak height of 122cm (48″). It has two storm doors which can be opened and closed independently, offering great panoramic views or full storm protection. A cunningly designed overhang also allows one or both doors to be left open in calm, wet conditions. This really helps to improve airflow and goes a long way towards eliminating the condensation problem often experienced in less well ventilated single wall shelters. With one or both doors closed, there is good vestibule space and the rainbow zipper provides easy access no matter how you set things up. The canopy is made of the highly innovative Cuben Fiber, an amazingly light but incredibly strong material that is used in sailmaking and the construction of airships. It is available in 4 colours (drab olive, blue, camo and spruce green) and three different weights – I opted for the lightweight drab olive for a more stealthy setup. The tent has a sown in 20cm (8″) bathtub floor, made of a thicker and more robust Cuben Fiber, and fully enclosed bug netting. Needless to say, it is not cheap! Weight – One of the lightest fully enclosed shelters in the world! Space – Liveable space was important to me. Potentially I am going to be spending a lot of time in this tent and I didn’t want to feel like I was going into a coffin every night. Thankfully I am only 163cms (5’4″) so the Solplex should feel quite palatial. I can comfortably fit myself and all of my gear inside, I can sit up easily, plus the generous entry height also means that I shouldn’t need to be crawling around on all fours (something that is best avoided as you reach my stage in life). The semi-transparent property of Cuben Fiber material also makes the tent “feel” more spacious and connects you with the outside world … lovely! Setup – Simple and fast to pitch, no poles to put together and no inner and outer to worry about. The two pole set up keeps the walls considerably more vertical than many single pole shelters, which in turn helps to increase the liveability of the tent. The footprint is small enough to allow for pitching in tight spots. I will be securing the Solplex with 6 MSR Mini Groundhog Stakes – 60g (3.5oz). These are top quality Y-Beam design stakes with excellent strength-to-weight ratio and brightly coloured so hopefully hard to misplace. I will supplement these with 2 Terra Nova Superlight Titanium V Stakes – 20g (0.7oz), which offer an increased surface area for the critical load-bearing points. Finally to keep the expensive little buggers safe and organised, a ZPacks Cuben Fiber Stake Sack – 3g (0.1oz). First off, just a word generally about my sleep system. Sadly I am no longer in the first flushes of youth and although I’m pretty tough and don’t mind roughing it, I do believe that it is hard to put a price on a good nights sleep. For this reason, my sleep system is heavier than it could be but I am happy with this and know that the setup is incredibly warm and super comfortable. Over the years I have used and owned a great number of sleeping pads but this is hands down the best of the bunch. Being down filled it is incredibly warm and oh so comfortable. The thing never leaks … something that seems to be a persistent problem for me with all of the Therm-a-Rests that I have owned. It is also very quiet to sleep on, none of that rustling that you get with neo-airs. Pack size and weight are still very acceptable and, with such a warm pad beneath me, I am able to save weight on a lighter top quilt. I use an Exped Air Pillow UL – 47g (1.6oz) with the mat, preferring this over the “down jacket stuffed in a bag” option, mainly because on really cold nights, when I need to wear the jacket for extra insulation, I am left pillowless. The mat also comes with the Exped Schnozzel Pump Bag – 62g (2.2oz), basically a big lightweight dry bag which is used to inflate the mat without getting moisture into the down core. It doubles as a stuff sack for my quilt, liner, pillow and clothes. The move away from traditional mummy style sleeping bags towards top quilts is definitely gaining momentum. To be honest, I’ve been using my old Marmot Hydrogen as a demi-quilt for ages now, so it seemed only logical to get fully on board the quilt revolution. The increasing popularity of hammock camping has also given rise to a greater number of quilts coming on to the market and so choosing one was not so straightforward. However, Enlightened Equipment quilts certainly seem to tick all the boxes for me and the price point is acceptable. The Revelation has a partially zippered drawcord footbox which means it can be used in a number of configurations from fully opened out and flat like a blanket to cinched up tight like a more traditional bag. Every quilt also comes with pad straps to hold the bag in place on the mat and stop drafts. EE utilises a unique Shiftless Baffle system that keeps the down firmly in place and prevents cold spots, something my old Marmot suffered with. The bag can be ordered in any number of colour, temperature and size configurations. All quilts are filled with moisture resistant DownTek and the outer fabric has a DWR finish. I choose the 950 fill power which offers the highest warmth to weight ratio. Quilts don’t have hoods and so I use an Outdoor Research Down Beanie to keep my head warm on colder nights. I use an Icebreaker merino sleepwear/base layer, which also has a hood. I also make use of a Lifeventure EX3 Silk Sleeper – 120g (4.2oz) which not only adds a couple of degrees but more importantly keeps the bag clean and the down in the best possible condition to do its job effectively. I also carry foam earplugs and use my Buff as an eye shade when necessary. The biggest quandary I faced in this department was whether or not to go stoveless. On balance, I decided that something hot to eat and drink at the end of a cold, arduous day was worth the relatively small amount of weight I would need to carry. Moreover, the thought of 140 mornings without coffee was not something I even wanted to contemplate. Allegedly the lightest gas canister stove in the world. Once unfolded, the supports offer a sufficient 85mm (3.3″) diameter, it has a good sized burner, a tiny pack size and costs significantly less than many of the better-known brands. Power output is rated at 2700w, it boils 1 litre of water in just under 3 minutes and consumes roughly 140g per hour … what’s not to like? I carry a Bic Mini – 10g (0.4oz) to light it. The flints in these little things hold up really well and seem to work even when wet. The perfect combination of size, shape and weight. It holds enough water for rehydrating a typical serving of thru-hiker food. It doubles as an epic mug for the all-important morning caffeine fix. The pot has easy to read graduations on the inside taking the guesswork out of measurements. With a diameter of 104mm (4.1″) it is very stable on my stove and will easily nest with a gas canister, the stove, lighter and a Kathmandu Micro Camp Towel – 25g (0.9oz) that I use to clean up with plus it stops the whole package from rattling as I hike (nothing more annoying!). The whole set up is stored in a small Zpacks Cuben Fiber Stuff Sack – 3g (0.1oz). Cooking on the PCT is not really cooking, or at least it won’t be for me. To make life easier, I plan to Freezer Bag Cook for my entire thru-hike which means no pots to wash and super quick cook times. The principle is ingeniously simple, just prepackage dehydrated food in a freezer bag, add boiling water and let it sit in a Big Sky Insulite Food Pouch Cozy – 37g (1.3oz) for about 10 mins and voilà, dinner is served! Getting into the far corners of freezer bags can be a challenge so I will need my Toaks Titanium Long Spoon – 15g (0.5oz). Keeping my food safe on the PCT presents another challenge. For certain sections, I will need to carry a bear proof canister. It’s big and bulky, often doesn’t provide sufficient space and it weighs a ton! Most thru-hikers use a BearVault BV500 because it’s cheap and gets the job done. I plan to pick one of these up when I get to Kennedy Meadows. The rest of the time I will need to fend off rodents and other critters. For this, I am using a Zpacks Blast Food Bag – 40g (1.4oz) which is made from heavy-duty Cuben Fiber and will hopefully stand up to inquisitive mice! Water is the elixir of life and on the PCT it becomes the focus of much attention. Every day, to a greater or lesser extent, it needs to be found, fetched, carried and made safe for drinking. In the hot, waterless desert sections this can become an arduous burden. My plan is to use a Source 3L WidePac Hydration Bladder – 125g (4.4oz) and then supplement this with two 2.0L Platypus Platy Bottles – 36g(1.3oz). This will give me a total of 7 litres, which will hopefully be enough through the dry sections. The Aquaguard Micro is a military spec filter, manufactured in the UK and used extensively by NATO peacekeeping forces throughout the world. It offers incredible versatility (thanks to its quick-disconnect system), is completely field serviceable with a built-in sediment filter, boasts excellent flow rates (500ml per minute) and a filter life expectancy of 1,600 litres (over 11 litres per day on my planned 140-day hike). This filter will remove threats from bacteria, viruses and chemicals, providing clean, safe and tasteless drinking water instantly. Personally, I think this filter makes the Sawyer Squeeze look like a kids toy! Still not convinced? There is an excellent review on the Section Hiker website (click here). A fantastic little head torch that I have happily owned and used for many years. It has two output levels, the dimmed setting is great for close up work, while the brighter setting is more than adequate for night hiking. You can flick easily between wide and focused beams, it has a white strobe and a red light for night vision. I have the optional USB rechargeable battery pack but it can be converted back to regular AAA batteries at any time. Highly recommended and pretty lightweight too, but sadly now difficult to find as Petzl has discontinued the model. Once again, a long-standing favourite. This great little knife has been with me for well over a decade. Everything you need in a tiny package; incredibly strong spring action scissors, a super sharp blade, bottle opener, screwdrivers, tweezers, nail file and cleaner. The perfect solution for those much needed on trail manicures and pedicures. An amazingly light, highly effective and tough little trowel for taking care of business and ensuring that I leave no trace! Note to self: start digging at the very first signs of need, do NOT wait until the situation becomes more pressing! Gorilla Tape / Cuben Fiber Repair Tape For repairs to shelter, pack, sleeping pad, jackets etc. 5m x 2mm Dyneema Cord / 2m x 3mm Shock Cord Use for washing line, extending guy lines, bear bagging, lashing stuff to the outside of my pack, emergency laces etc. Needles & Dental Floss / Safety Pins – 15g (0.5oz) Repairs to clothing and fabrics, popping blisters! Carabiners (x2) – 10g (0.4oz) Hanging and clipping stuff. One of the most vital pieces of equipment that I will be taking with me on the trail is my iPhone 6 & LifeProof Case – 160g (5.6oz). This will store my PDF maps for the entire trail, together with trail and re-supply notes. I also plan to use both Halfmile’s and Guthook’s apps. My phone will also provide on trail entertainment in the form of music, audiobooks and podcasts. With the WordPress app, I also hope to blog as regularly as time and exhaustion will realistically allow. Pictures will be provided by my Olympus TG2 – 230g (8.1oz), which is waterproof, shockproof and hopefully trail proof. With the help of an ingenious little gadget called a StickPic – 10g (0.4oz) I can also transform my walking pole into a selfie stick. All of this gadgetry needs a lot of power. I’ve had absolutely zero success with any type of solar charger, so I plan to use an Anker PowerCore+ 10,050mAh Battery Pack – 236g (8.3oz) to recharge my phone, camera, watch and headtorch. Anker makes the smallest and lightest 10,000mAh battery pack that I have managed to find. It also incorporates an amazing fast charging technology which means that the PowerCore+ can be recharged twice as quickly as other batteries of this capacity. This is really handy and hopefully, I won’t need to waste time sitting around waiting for the thing to charge. To get the most out of the Anker and maximise the number of devices I can charge at a time, I plan to use an Aukey 3-Port USB Fast Charger – 85g (3.0oz). This will allow me to charge the battery pack, phone and camera all at the same time. Less charging tie = more trail time! Charging cables for my various devices will add another 98g (3.5oz) to my base weight. I plan to keep all of this elec-trickery protected in a ZPacks Custom Cuben Zip Pouch – 15g (0.5oz), together with a Waterproof Notepad, Sharpie, passport, cash and cards – 225g (7.90z). SPF 50 Sunscreen – 62g (2.2oz) Will hopefully be able to ditch this after the first couple of weeks and so not included in base weight. Wet Wipes – 20g (1.8oz) Probably futile but I will carry these in an effort to keep the “funk” at bay. Will re-stock at every re-supply so have included in base weight. MacPac Nano Towel – 50g (1.8oz) I intend to wash when water supply allows, therefore, I need to dry too. Deodorant – 45g (1.6oz) Another probably futile gesture! I use a solid deodorant removed from its unnecessary heavy plastic packaging and simply kept in a small ZipLoc. Dr Bronner’s Soap – 40g (1.6oz) For all washing related tasks. Blistex SPF30 Chap Stick – 10g (0.4oz) Because I enjoy having skin on my lips. Toothbrush – 7g (0.2oz) Chopped in half as required by ultralight “rules”. Pee Rag x2 – 6g (0.2oz) Small square of absorbent cloth carried on outside of pack to deal with “number ones” and minimise use of TP. Toothpaste – 5g (0.2oz) A handful of homemade dots, simply chew and brush. Gold Bold – 40g (1.4oz) Medicated powder to keep all of the important bits dry and chafe free. It does help; I think i will go for a solplex. It’s grim to think that even a 10 degree F may not be enough (any reccomendations? Who goes lower then 10 degrees at a reasonable weight?) I really hope you do a post-gear review, but more importantly than that, keep going….thank you! I definitely plan to review all of my gear when I get off the trail. Hello Hollywood, there are a number of wanting to know what happened after your last PCT post. Regardless of how far you traveled, there are a number of your supporters who are interested in the end of your adventure…would you mind posting a final blog? Which pack are you using, the zpacks or exped? How do you like it so far? ZPacks Arc Blast … Fantastic but you really need to be ultralight. This pack won’t tolerate being overloaded. If you can keep it under 35lbs total its a fantastic pack! Wow, fabulous list. Thanks for sharing! I especially love your no-dishwashing cook system. I usually backpack with meals premixed in an oven bag for exactly the same reason. I hate cleaning up. The extra long spoon is a must for bag-corner scraping, didn’t know those even existed! I look forward to hearing how the Cuben tent and pack survive all the miles. They’re so lightweight, it’s hard to believe they’re tough enough to last. Great gear list, I always meant to do one for my thru last year but never got around to it. I’m not going to tell you what you need or don’t – but I will just tell you that the wet wipes and soap I was carrying at the start of my hike last year were the first things to be dumped in a hiker box at the first opportunity!! I would also ditch the deodorant, there is a absolutely nothing that can be done to combat hiker funk! Hey Alex … I loved following your journey(s) last season! You’ll work it all out as you go! I might be heading southbound this year so make sure you say hi if our paths cross!